Sea Kayak with Gordon Brown Volume 2 DVD preview. I wasn't going to review Sea Kayak with Gordon Brown Vol 2 DVD for several reasons. Many of you will know I am friends with both Gordon and with Simon Willis, who has produced, directed and edited the DVD. Also, I appear in the expedition section as I was lucky enough to be on the voyage to St Kilda aboard the MV Cuma that features in the DVD (as a full fare paying passenger). However, now that I have have made a declaration of interest, I feel better and you can keep it in mind to judge whether I am being objective or not. 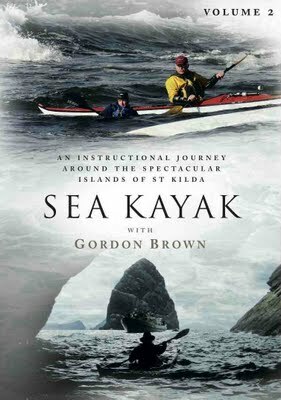 Almost exactly two years ago, I published one of the first reviews of Sea Kayak with Gordon Brown Vol 1 DVD. In it I said that it had achieved a new standard for sports technique videos. I was not surprised when it went on to win several awards. I have watched the preview of Sea Kayak with Gordon Brown 2 many times and it has raised the bar yet again. This is no dull technique DVD, filmed on flat water, there is a great deal of white water in this DVD! The technique section is divided into 8 parts covering up to date ideas on handling rescue situations and towing. The filming has been done in the environment and weather conditions that developing sea kayakers aspire to. It shows Gordon illustrating rescue and self rescue techniques while actually coaching students. Some of them, like Janice, are extremely long suffering! However, don't get the impression that Gordon is not prepared to get wet. Far from it, my heart was in my mouth watching him swim his kayak ashore then launch again in heavy surf, which was breaking into a rocky gully on the remote island of Cearstaigh off the coast of Harris. The final section on "anticipation and reaction" is designed to help you avoid the need to be rescued and builds nicely on the handling of a kayak in fast moving tidal waters that was introduced in DVD 1. As with Volume 1, the filming and particularly the quality of the "on the water" sound recording is outstanding. Volume 2 also features a journey, this time to the remote St Kilda archipelago, which lies 40 miles west of Scotland's Outer Hebrides. For me this is what makes this series of instructional DVDs unique. It is learning techniques in the context of and environment in which they will be applied. Ultimately sea kayaking is about the journey and learning the techniques, so clearly demonstrated in this DVD, will make your journey safer. During filming of the journey section, one of the team capsized and made a wet exit on the exposed SW coast of St Kilda. The rescue took seconds and a second rescuer was standing by to tow both rescuee and rescuer off the rocks if required. The paddler had not been dressed for immersion and quickly began to feel cold but a variety of spare over-cags, hats and gloves were produced to prevent hypothermia and the planned route was changed, given the weather conditions and the rescued paddler's condition. It was a wonderful, unrehearsed demonstration of the effectiveness of the techniques demonstrated earlier and more importantly the overall leadership and planning required to paddle safely in a demanding environment. St Kilda features throughout the DVD and there are interviews with both Hamish Gow, the first paddler to reach it and Donald Thomson, the paddler who led the party which made the first return crossing. The DVD is enriched by cine film of St Kilda shot by Gow in the 1960's. His description of his navigational method is a treat, though it might not feature in the BCU 5* syllabus! I think that kayakers of all levels will learn from this DVD. Each time I have paddled with Gordon Brown I have come away with the confidence to take on more challenging conditions when paddling on my own trips. Sadly not every sea kayaker can have personal coaching from Gordon but this DVD is the next best thing. Sea Kayak with Gordon Brown Volume 2 is the result of a unique synergy between a coach at the top of his game and a talented film maker, who is himself a sea kayaker. I expect to see this DVD win several more awards for Gordon and Simon. The deep water rescue in detail. Also the scoop rescue for an injured kayaker. Gordon’s coaching programme will help you teach yourself this vital skill. Starts with paddle float straddle and leg hook and leads on full re-enter and roll. Heart stopping footage of landing and launching safely on wave swept shores. Making and modifying contact tows, plus their correct use in calm and rough water. Modifying and using tow lines. Using for rafted and ‘dog-lead’ tows on injured kayakers. Kayakers tackle challenging real-life rescue scenarios. Rough water paddling skills to help you avoid the need to be rescued or towed.